Local people have expressed disgust at the ‘bombardment’ of unionist and loyalist flags and warned that authorities could not continue to ignore the ‘intimidation’ of people from other backgrounds. Police have confirmed that they have received a number of reports regarding the erection of flags in the Waterside. Particular concerns have been raised over the proliferation of flags along main arterial routes into Derry and the painting of kerbstones in union flag colours in both the Waterside and cityside areas. A Waterside man, who did not want to be named for fear of being targeted, said that he, like other people, felt intimidated. “Travelling from the Waterside to the Derry side, the different routes I can take such as the Crescent Link to the Foyle Bridge are plastered with flags and there is more and more this year,” he said. “This year they are painting kerbstones red, white and blue going into Caw Park and also in the area by Abercorn Road it’s the same. “At Drumahoe there are flags the size of bedsheets and there’s more in Dungiven Road too. “I don’t care who’s who, but it is disgusting for people coming into Derry and for Catholics living in Derry it’s a statement in your face: ‘We’re the top dog and you are only second class citizens’. It is getting worse. I am sick, sore and tired of this.,” he blasted. 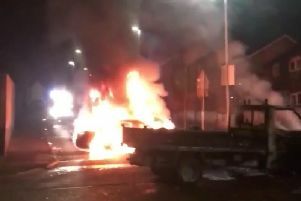 The man said such displays showed that bigotry still exists in Derry, adding that “nobody does anything about it”, despite lampposts and other infrastructure being paid for by the public. A local woman, who also asked not to be named, said she had lodged a complaint after black directional arrows on a roundabout in Limavady were re-painted red and blue. Within weeks of the roundabout being returned to its original state, it has been painted again in the union colours. She added; “A flag should not be anywhere but on a flagpole. It is intimidating to those who live there, devaluing to those who are selling their homes and if you live in a mixed community, where is the equality, where is the civil rights? Superintendent Gordon McCalmont commented: “The flying of flags in public places is an issue that provokes a range of strong responses and very different viewpoints. “The type of flags flown, how, where and when they are flown are all important considerations. “The removal of flags is not the responsibility of the Police Service of Northern Ireland and police will only act to remove flags where there are substantial risks to public safety. “We will continue our work with communities and partners and respond to any issue where there is a concern for public safety or where it is believed a criminal offence has occurred. A Department for Infrastructure spokesperson said: “The Department does not approve of the unauthorised use of departmental property, which is an offence under the Roads (NI) Order 1993, however, the removal of flags needs to be treated with sensitivity. “The Department acts in accordance with the multi-agency Joint Protocol in Relation to the Display of Flags in Public Areas that was introduced in 2005. The Department’s operational policy in relation to the Protocol is that once the location of a flag/ banner complaint is established, the PSNI will be contacted to determine if there will be community tension if removed. If there are no public order issues then the next step is to ensure the safety of staff/ contractors prior to the removal.